Lighting is an essential part of any home so it should be easy to set the mood in any area of the home or your entire home with the press of a button. With lighting solutions from Home Theater Evolutions your lighting scenes can be used for entertaining, safety and much more. Intelligent lighting can be added into any home, new construction or existing. 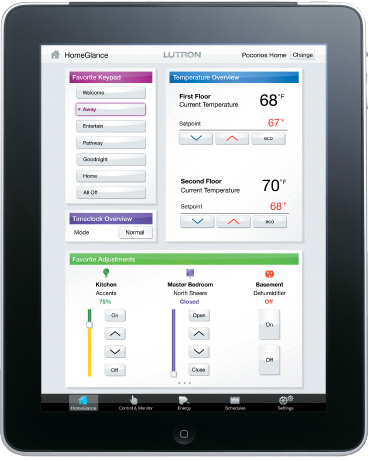 We ensure that the user interface is easy to use for the whole family, control your entire home at the touch of a finger. Savant Lighting Control has transformed LiteTouch® products into a dynamic lighting control solution that can be used as part of a complete package within Savant’s automation and energy management ecosystem or as a standalone lighting control system. Savant Lighting Control will take advantage of Savant’s expertise in highly efficient software-based system configuration, compact powerful hardware devices and renowned user interface options. We take lighting for granted because it’s so ubiquitous. Most rooms have overhead lights as well as task lighting in specific areas. Almost all houses have exterior lights, some of which are activated by motion controls or light sensors. Just about every room in your house is likely to have multiple lighting options, with several options for dimming. So what’s the best way to manage it all?